It's high time to change your own room into a theater! Choose our sound bar, you can enjoy a sound feast now at home. > Unique acoustic design with premium sound brings you feelings of coming to a real movie scene. > Infra-red remote control, along with Bluetooth connection, frees you from trammel. You can control the TV sound bar without a move. 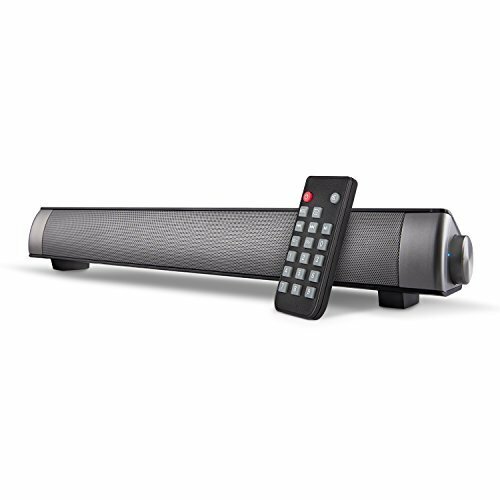 > Built-in large capacity Lithium battery brings you long-lasting pure sound enjoyment. > Insert a TF card with MP3, WMA, WAV, FLAC and APE files in it and enjoy the unbeatable music. > Thoughtful power-saving design enables itself to automatically switch to “Sleep Mode” when it has stopped working for one hour.